The only major change from last month’s polls is the official date for Ben Affleck’s 1930s crime drama Live By Night being pushed to October 2017. 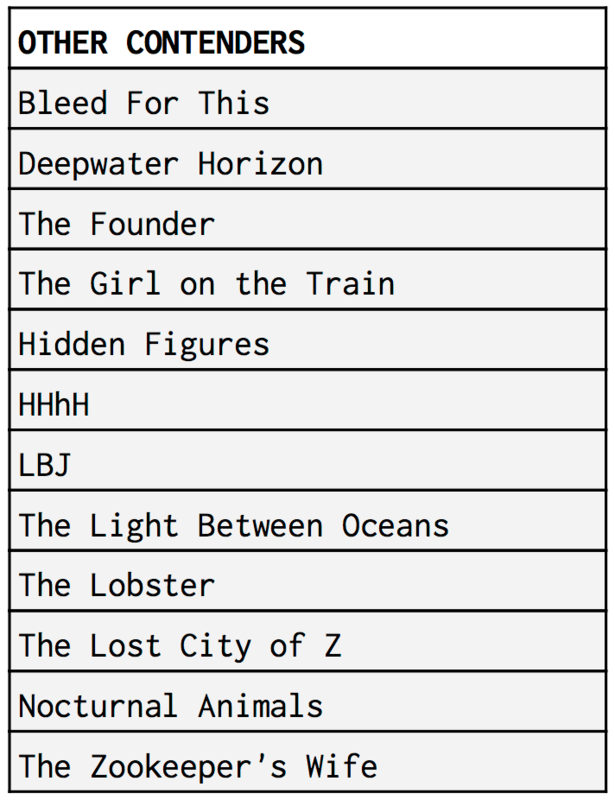 That allows for the films outside of the top 5 (which is unchanged) to move up a bit. Lion moves into the top 10 on the strength of the announcement from The Weinstein Company that it’s getting that studio’s coveted Thanksgiving slot. Historically this is the launching pad for what will be their #1 film for awards season. Michael Keaton’s McDonald’s movie The Founder originally had that date but was bumped back to August, not a good sign for that film. The announcement of the films in competition at this year’s Cannes Film Festival in less than two weeks could change this list dramatically next month. Loving is set to debut there while Silence is not going to. If any of the other films in our top 15 end up on that list you can bet their stock will rise in this race. Or maybe something just outside like The Light Between Oceans or The Zookeeper’s Wife gets a slot and finds themselves out of the ‘Other Contenders’ section and on next month’s predictions. Here are the April 2016 BEST PICTURE Oscar Predictions (click image to enlarge). You can follow the Oscar predictions from The Gold Rush Gang right here.